Let's get to the last of the ST group, this being the Twinkies rep Brian from HSCA. 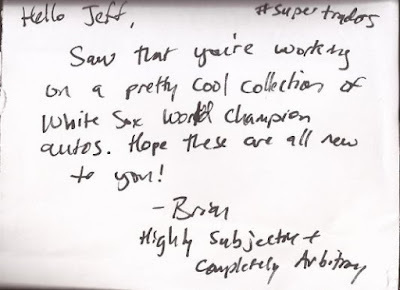 I don't think his blog is much older than a year (I could be wrong), but Brian has made himself known with the packages. Being so close to the Great White North, he seems to find a fair amount of vintage OPC baseball to pass around. He's blessed me with a few in the past. Must be all those lakes they got up there. Someone should count them. I'm going to guess at least 9,999. Recently, I received a couple separate mailings from him. Who needs '91 Topps? I do. In fact, my 90's team sets are woefully lacking. And I would post a link to them, but I just realized the Sox team sets link at the top doesn't have the 1990's link on it. Geeez - I'm an idiot. I'll fix that after I post this. Anywho - I guess that Abreu is from this year? Anyone? I am so ignoring the 2016 flagship that I really don't know all the cards that make up the set. I just know I got them all from Nacho Grande Chris in his group break. Now I have links to these vintage sets. The Lown/Staley is an upgrade. Hoyt is a miscut like the Morgan, but unless I find a deal for a replacement, he's just fine as he is. Heritage can't hold a candle to the originals. Why yes. Like any true collector, I am juggling too many things at one time. You Minnesotans are smart ones. Brian dropped 7 new autographs for the binder. 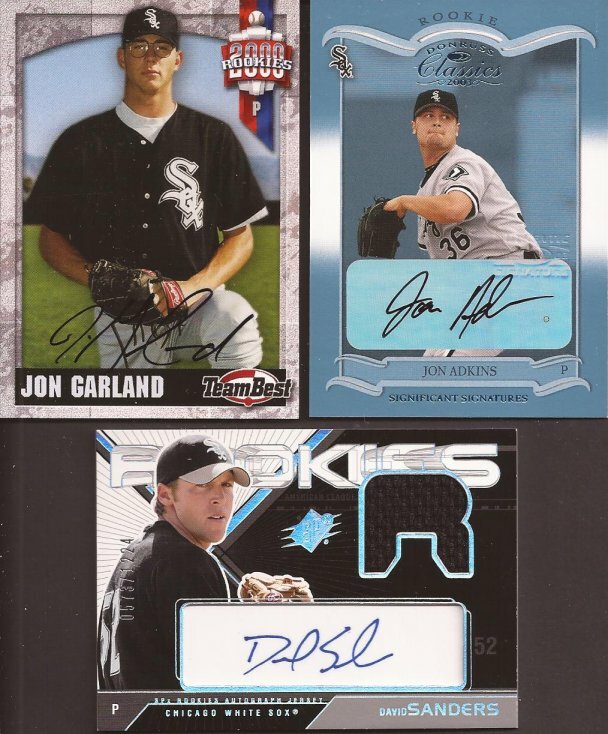 I was about to send out TTM on a few, but now I don't need to. Three from the mound. Garland had a hell of a 2005, going 18-10 and winning once against the Angels and starting the 14 inning game against Houston. Adkins appeared in just 5 games for the Sox. Sanders appeared in 2 games, pitched 2 innings and gave up 3 earned runs in 2005. But at least he is off the needs list. Heading to the outfield we have Willie Harris and Joe Borchard. 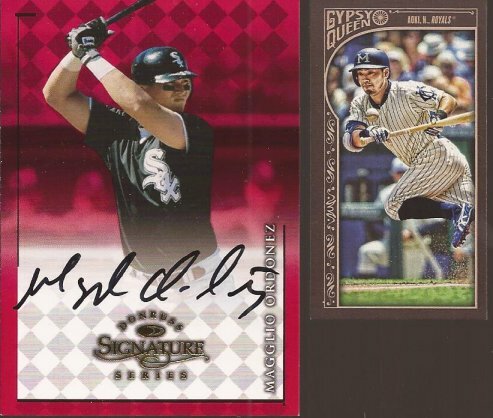 I was about to send a TTM to the White Sox rookie league team in Great Falls as WIllie just joined the club as a hitting instructor. No longer needed now. Joe. 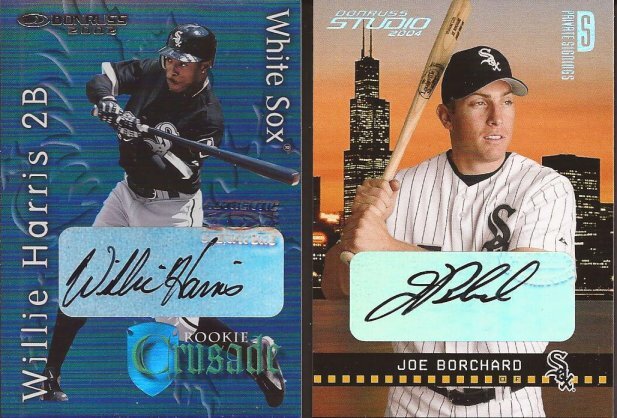 Joe..... we had such high hopes for Borchard, but he was so incredibly inconsistent. First round draft pick that showed flashes of something, but then long stretches of nothing. 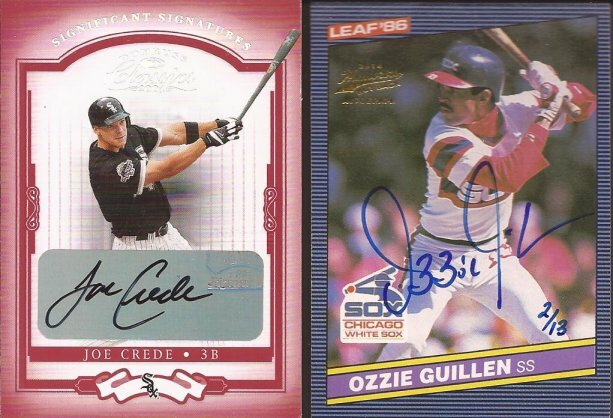 I pick up Crede autos here and there, and just never add them to the 2005 Project. This is a beautiful and clean signature, so it gets the call. And how about that Leaf buy back??? Numbered to /13. It has a crease down the middle, and I hope you got a hell of a deal for it, Brian. I don't care - I think it's a beautiful card and perfect for the binder. All 7 put me at the half way point - 23 autographs of 46 people. Thanks again Brian. I've been lucking out Twins-wise lately, so look for a return package. I'll try not to make you wait. there are closer to 15,000 lakes here, although i don't know what the criteria for lake is, as opposed to pond or puddle. now then, the mats were my favorite band before i moved here, and getting to see paul and tommy back together in 2014 (25 years after i first saw them live) was fantastic. i'm going to see another minnesota native (craig finn of the hold steady) tonight, so when you get that pwe from me next week, i'll expect to see a link to one of his/their songs.